Rabbi Eli Ben-Dahan describes how 'army is pulled by Supreme Court instructions' and was forced to publish shaving rules. 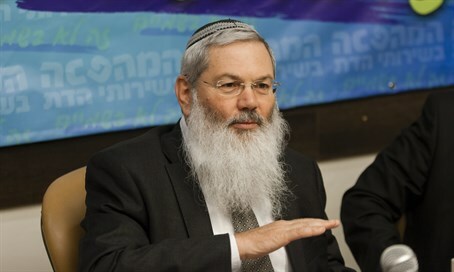 In an interview with Arutz Sheva, Deputy Defense Minister Rabbi Eli Ben-Dahan (Jewish Home) said that the turmoil of soldiers being forced to shave their beards is over. He added that anyone who requests an exemption from shaving on religious grounds will receive it, as about 13,000 soldiers and commanders have so far. During the talk, Rabbi Ben-Dahan was asked to explain what led up to the new shaving instructions. He insisted that no one in the army wanted such an order, but that the IDF was forced to comply with the Supreme Court's instructions. "Until about eight months ago, anyone who wanted to grow a beard received permission and everything was clear. What happened was that a group of non-religious soldiers appealed to the Supreme Court against the army, asking why a religious soldier has a simpler and easier path to growing a beard, while a non-religious soldier who wants to grow a beard goes through a more complicated route to receiving permission. "The Supreme Court, as usual, claimed that the State of Israel, and of course the army, must act equally and so demanded that the army set equal standards and not discriminate between religious and non-religious soldiers. It told the army to make a single path for anyone who wants to grow a beard." Ben-Dahan continued by describing the series of events: "Following this, the army reevaluated and changed its instructions to make a single route for all IDF soldiers to receive permission to grow a beard. You need to know where this comes from. It comes from a Supreme Court ruling. The army has no interest in preventing religious soldiers from growing a beard." In light of all this, Ben-Dahan declared that "any religious soldier who grew a beard before the new order and has not yet received a confirmation from the adjutant officer, or who was turned down and appealed and still hasn't received an answer, can continue growing his beard and no one will stop him. "It has been found that almost 25,000 soldiers asked for shaving exemptions; 13,000 were answered and the rest are still waiting due to the heavy workload placed on the shoulders of adjutant officers and so this is a clear instruction - whoever grew a beard and did not receive an answer from the adjutant officer or was denied and appealed, and every soldier is eligible to appeal within five days, can grow his beard." The Deputy Minister pointed out the additional track for hesder soldiers to appeal through the Hesder Yeshiva Association. "I have no doubt that, in the end, every religious soldier who wants to grow a beard and wants to continue growing a beard will not be forced to shave." Furthermore, "if there are specific instances, I am ready to support every case. They should come to me. This is a large system. When there are 25,000 requests there will be problems in specific places and, if there are such problems, I am ready to check each and every instance brought to me." As for the Tel Nof base, where the story began and from where a soldiers were sent to prison for refusing to shave, Rabbi Ben-Dahan says that he does not know the specific details about the base and complaints from Tel Nof have not reached him. On the claim that was published by Arutz Sheva on Saturday, that a religious officer was told to shave his beard and only afterwards receive a new exemption, Ben-Dahan again said, "That is why I say clearly that every soldier or commander who appealed to their adjutant commander and still has not received an answer, and had a beard previously, can continue growing his beard and no one will force him to shave. In addition to this, whoever was turned down and appealed, and has not yet received an answer, can continue growing his beard and no one will make him shave." The Deputy Minister rejected attempts to tie the issue of beards to the earlier issue of the role of the Jewish identity program in the IDF. "There is no connection between the two," he said and again noted that the driving force behind the recent decision was the Supreme Court, not the army. "The army is dragged into changing its protocols because of the Supreme Court. The army has no interest in this rule. I suggest that you don't hang other accusations on the army. The army will do all it can to solve the religious soldiers' issues as quickly as possible." Towards the end of the interview, Rabbi Ben-Dahan was asked about the additional issue gathering attention - that of the upcoming draft scheduled to fall on Purim. Rabbi Ben-Dahan was asked if this is a systematic error, even if a solution is found to accommodate individual soldiers. "The specific cases about which people talked to me have been solved, and the draft has been advanced by two days. The local problem has been solved. I agree that there may have been a systematic error here and I will take care of it. The problem is that, sadly, the army doesn't always look at the Hebrew date but rather the Gregorian date, and so problems result. This issue will be brought up and I will deal with it. And I hope that such errors won't occur in the future."